Capt. Jeff Terrell (United) squats in front of his Cessna 172 Skyhawk with one of his passengers. Pets hold a special place in our hearts. They’re additional family members that provide us joy and comfort. Capt. Jeff Terrell (United) knows this firsthand. The owner of a Husky named Kai and a Lab named Bella, Terrell is also one of more than 5,000 pilots who in their spare time fly volunteer missions for the Pilots N Paws Pet Rescue Services®. Established in 2008, Pilots N Paws (PNP)—a 501(c)(3) charitable organization—facilitates the adoption of foster and animal-shelter pets in the United States by providing a network of private pilots who transport these animals when the distance between owner and pet is significant. The founder of the organization originally coordinated with a private pilot to transport a Doberman from Florida to South Carolina, conceiving the idea for the operation. Several years ago, Terrell volunteered to foster a rescue dog that was transported on a PNP flight to his home in Clear Lake Shores, Tex., a suburb of Houston. When he received the dog, he quickly learned that she was pregnant, and fostering one canine turned into taking care of eight. Happily, homes were found for the mother and her seven puppies, and Terrell decided to become a PNP pilot. Pet overpopulation is a global problem. The World Health Organization estimates that there are more than 200 million stray dogs alone. In the United States, the American Society for the Prevention of Cruelty to Animals® calculates that approximately 6.5 million companion pets enter animal shelters nationwide annually and that nearly 1.5 million are euthanized. 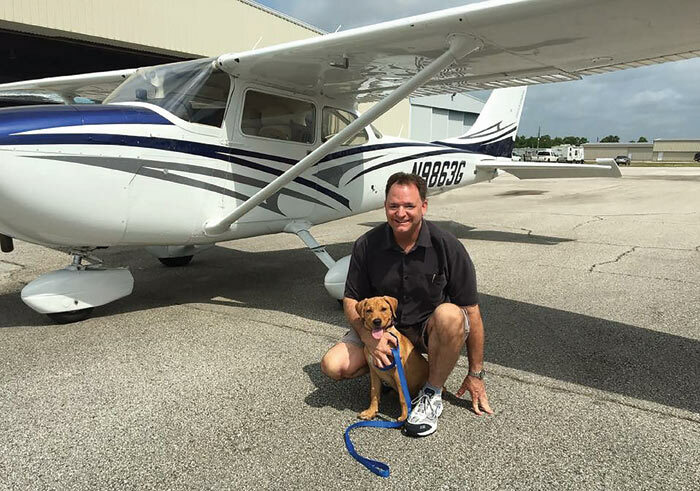 Terrell flew his first PNP mission to Austin, Tex., transporting those seven puppies. The United captain removed some of the back seats of his Cessna 172 Skyhawk to better accommodate the seven crates that would be needed. “It was a little chaotic,” he said, noting, “they were yapping while I was trying to talk with air traffic control.” Eventually, a controller, commenting on the sounds heard over the radio, asked Terrell if he had dogs with him. The pilot confirmed his payload with a chuckle. Since then, Terrell has flown numerous PNP flights. Last fall when Hurricane Harvey socked much of eastern Texas, a couple who live in nearby Beaumont reported that their two dogs had escaped during the storm and were nowhere to be found. Miraculously, the pets showed up in a Houston-area animal shelter. However, both were scheduled to be euthanized if someone didn’t claim them soon. Terrell made a trip to the shelter, and while there he learned that two other dogs also needed to be transported to Beaumont. Terrell and his wife Angie, a former ExpressJet pilot and PNP flyer, flew the four canines back to Beaumont, which proved opportune because the roads between the two cities were impassible at the time. To make the brief jaunt, the Terrells used Angie’s Beechcraft King Air 200 because the dogs were large and would need additional space. PNP advises, “Sedating animals during flights is a decision best left to veterinarians. It’s probably not necessary to sedate an animal unless it has some type of behavior problems or is easily scared.” Terrell acknowledged that the animals he’s transported have never needed sedation. However, he noted that it’s wise to fly with a pet handler, and Terrell and his wife frequently accompany one another on their respective missions. The United captain remarked that he mostly flies dogs but has also delivered a cat or two on occasion. The PNP website notes that dogs, cats, pigs, reptiles, and rabbits are just a few animals that have been taken on one of the rescue organization’s flights. Becoming a PNP pilot is easy. Visit www.pilotsnpaws.org and thoroughly review the guidelines. Complete the registration process and indicate what kind of plane you fly and the distance you’re willing to travel. How much you participate is completely up to you, and no one schedules your missions or pressures you in any way. Pilots use an online forum as well as a search tool to access requests that meet their criteria. If you don’t have animal crates, the organization can provide them. Details about the mission process, securing flights, and FAQs are available on the website. Because the FAA treats Pilots N Paws as a “humanitarian” organization, pilots who fly PNP rescue missions are eligible to claim a tax deduction for portions of their trips. “Pilots N Paws is a wonderful organization, and my wife and I plan to continue flying missions whenever we can,” said Terrell, adding, “the most rewarding thing about these trips is just how appreciative people are when you deliver these pets.” More importantly, by serving as a PNP pilot, he’s saving lives. Interested in supporting Pilots N Paws, but not ready to fly a mission? Follow PNP on Facebook and Twitter. This article was originally published in the March 2018 issue of Air Line Pilot.